Alright so here goes the hottest topic of discussion over the past two weeks, other than Gronkowski’s ankle. 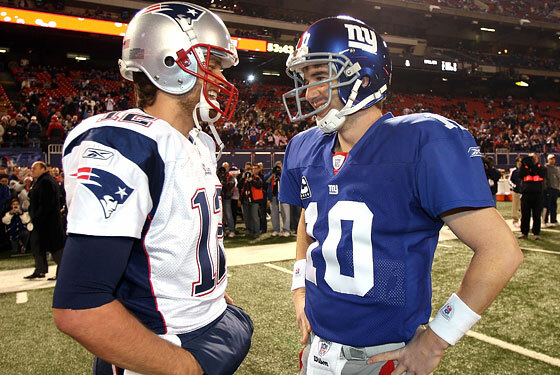 The battle of two great quarterbacks in Sundays Super Bowl. Eli vs. Brady. Who has the edge? Eli Manning is a great quarterback and that isn’t something up for debate. He has proven in the recent years that he can win the big games when it matters. His bold statement he made prior to the start of this season doesn’t look as crazy as it did before. This season has completely changed Eli’s career as far as I see it. Everyone questioned his ability to make the accurate decisions on the field. Eli has been often criticized for his mistakes and it’s been well deserved. Eli has the tendency to make that great play, then follow that great play up with a rookie-like mistake. It showed last season when he threw 25 interceptions, and although that number dropped this season he still ended up throwing 16 this year. Yes Eli is a quality quarterback, but the recent comparisons between him and Tom Brady just are not warranted. What separates quarterbacks like Eli, Romo, and Rivers from Brady, Peyton, Rodgers and Brees isn’t the amount of yards or touchdowns they throw. It’s keeping the mistakes to a minimum. So unlike most people my opinion differs. Eli Manning is not a top tier quarterback. Like I stated above, there is no discussion when it comes to comparing Brady with Eli. Tom Brady is on another level. Brady has earned the right to be put in the same class as his idol Joe Montana along with the other greatest quarterbacks in NFL history. Yes Brady struggled last week, but not too many QB’s don’t struggle against the Ravens defense. After the Broncos game the talk was all about how great Brady really is. How quickly things change huh? Now it’s all about how he’s not as great as he used to be and that Eli is better than him. Everyone looks at last week to quickly decide whom you would rather have as your quarterback this week. It’s not even a question. Tom Brady is a proven winner. Brady’s career high for interceptions in a season is 14. Eli Manning has thrown 14 interceptions in a season SIX times. I still see Brady as being the best in the league at what he does but if someone is in his rear-view its Brees or Rodgersk, not Eli Manning. This entry was posted in Patriots and tagged boston sports blog, Eli Manning, Elite Quarterback, new england patriots, new york giants, super bowl, tom brady by davecouture. Bookmark the permalink.